The Front Porch Prophet is the story of A.J. Longstreet. Raised by his father and grandmother, A.J. is an honorable man and a loving father and husband. When A.J. is reunited with his old friend Eugene and learns that his friend is dying of cancer, he is forced to make an unthinkable decision. Eugene would like for A.J. to put him out of his misery when the time comes. The rekindled friendship stirs up many memories for the duo- both good and bad. This book is a collection of those memories and of the new ones they make together before Eugene's untimely demise. Raymond Atkins somehow manages to turn a sad situation into one of the most hilarious books I have ever read. I actually laughed out loud at several points in this book. Set in rural Georgia, the characters are unforgettable and the situations that A.J. finds himself in are unbelievable. The book reads like a couple of old men sitting around a campfire rehashing the adventures of a lifetime. I absolutely love good southern literature. 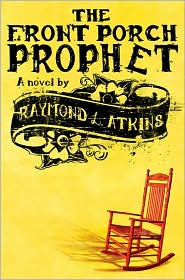 Raymond Atkins captures the spirit of the south and the humor of its people flawlessly. What I loved most about this book was that while it was very entertaining to read, at its heart it is a story of forgiveness and true friendship. I can not recommend this book enough. I would be willing to place it on my top five all time favorites list.